On occasion, when I write a story I don’t plan to submit, I’ll post it here for your reading pleasure (or otherwise). I particularly welcome comments and criticism on these posts – I mean it about the criticism, because I’m always looking to improve my craft. I’ll respond to any comment on a story posted here. Anyway, this story takes place in South Carolina, but not our South Carolina: it’s the South Carolina of this world. The story stands alone, and you should be able to tell some of what makes its world different from ours – if not, I’m not doing my job. Caroline began cooking at three, and she put up the flag at five thirty. “Sure is.” The flag was up, and that had meant one thing ever since tourists started coming this way by automobile: that anyone who cared to stop by and pay could have a seat at the table. “Your family here?” asked Nora, handing over a five-dollar bill. “No, just you and me. Dining room’s that way.” Caroline led them in to where the table was already set: a sweetgrass basket in the center with napkins and utensils; peanut stew with chicken and okra; fish fry with rice; cornbread and greens; a salad from the kitchen garden. There was no menu – people who came to house restaurants ate what the family ate – but she liked to make more than one thing so no one would get up hungry. “The festival.” Fred looked surprised that it could be anything else, and in truth it was the answer Caroline had expected. St. Helena Island always threw a party to celebrate the Sea Island Republic’s declaration of independence back in the Civil War, and with the hundredth anniversary this year, they were doing something special. The Sea Islands’ independence had been brief, but it was heroic, and here in Gullah country, people still felt it. “You’ll have a good time, trust me. Make sure you try…” But the doorbell cut the conversation short, and Caroline got up to bring two more tourists to the table. More people drifted in over the next hour: the next-door neighbors and the widower from up the street, a lone tourist all the way from Wisconsin, a family from Virginia. Caroline sat and chatted when she could and got up and served when she had to. It was a good mix and they all seemed to get along: once they got talking about the festival, she hardly needed to put a word in to keep the conversation going. At seven, when the Virginians came in, she thought about taking the flag down. Twelve people was all that would fit in the dining room. It was a nice night and she could sit a few more on the veranda, but she’d have to cook more and she liked to have everyone in one place when she brought out the pecan pie and the banjo. Caroline knew that voice, and when she looked up, she knew that face. “King of Mali, Sam, what the hell are you doing here?” She gave the guests an embarrassed smile – she never cussed in front of other people if she could help it – but then she turned back to the man standing in the door, and her look would have left him for dead if he’d had any shame. For a second, Sam looked like he wanted to say something else, but then he shut up and let Caroline lead him to the kitchen. She sat him under the militia rifle and Arabic calligraphy and across from the Freedmen’s Circle calendar, dished him out some stew and rice, and went back to take care of the customers. She was in the kitchen a couple more times before the guests left, and each time, Sam didn’t say a word and paid attention to his meal. She hurried the guests out faster than she’d planned – pie, yes, but no banjo playing tonight – and when the last one was gone, she walked in again and found him still there. “At your command, ma’am,” said Sam, and he disappeared into the dining room to clear the table. After, he scraped off the dishes, washed them in the sink, and handed them to Caroline to dry: it became a rhythm, and after a while it was almost like old times. “The kids gone?” he asked a few minutes later. Sam started to answer, then stopped, then started again. He was holding a dish, and he put it back into the suds. He stood there, and Caroline looked deep into his face: it was older now, with both of them in their forties, but it was still the one she remembered, with dark expressive eyes and the Rice Coast written on its features. “I know what you mean,” said Caroline – Anne Marie had been the life of the Lobeco Circle even when they were in school, and she’d seemed indestructible. “I don’t know who’ll keep things together now – I’m surprised the shout got arranged without her to organize it.” They both laughed again, the laughter of two people who’d grown up and who knew that life sometimes tasted bitter. Sam got up suddenly and disappeared down the hall – Caroline knew what for. She started putting the cups and utensils away, and with her mind on the task, it came as a surprise to see him standing in the doorway again. He was smiling, and it looked like he’d been there a while. “You still can stop a clock, Carol,” he said. “The hell,” she began, but she never got the words out of her mouth. She wasn’t sure if she should be angry, especially since she’d been thinking that Sam didn’t look half-bad himself for forty-two. “Don’t think you can buy my forgiveness with lies,” she finally said. Sam sat down again and the silence lengthened, but it had become a companionable rather than a hostile silence. “I’d like to go to Anne Marie’s shout tomorrow,” he said. “Allah carry her soul up high,” he said. It was the first line of a spiritual, and he sang the second: Caroline took her banjo down as she’d been planning to do hours before and finished it with him. She couldn’t sing worth a damn, so she played a harmony to his voice: her fingers found the strings naturally as they’d done at Circle dances a long time ago. “Yes, ma’am,” he said, and saluted. She laughed again and showed him where the linens were. “We’ll go to the shout together?” he said. Her lips started to form a no, but she turned around instead and was halfway up the stairs before she looked down. Somebody – maybe Bradbury, maybe Heinlein, maybe John D. MacDonald – said that you need to write a million words before you’ve learned the craft. I’ve never kept count, but I wrote for forty years before I sold my first story to a pro market, so I wouldn’t be surprised if I hit the million mark somewhere. And if I did, about half those million words were alternate history. History has fascinated me since I was a child, and the unknowable ifs of history – what might have happened if the past had played out differently – have appealed to my imagination for nearly as long. I was about ten years old when I read Murray Leinster’s Sidewise in Time, and from then on I was hooked. I read alternate history stories anywhere I could find them, and when I discovered an Internet discussion group on alternate history in 1995, I became a participant. I’ve played with historical what-ifs in one forum or another ever since. The magic of alternate history, like that of all speculative fiction, is that it’s open to nearly anything. What if Spinoza had gone into exile in the Ottoman Empire after the Dutch rabbinate excommunicated him? What if the Malê Revolt in Brazil had gone a bit better – not much better, but a bit – leading to a Jacobin Islam taking root in West Africa? What if the early split between the Kingdom and Republic of Haiti had become permanent? What if the kenbut (local justice courts) of ancient Egypt had assumed power by default during one of the periods of collapse, leading to the formation of quasi-republics? What if the Iron Age Nok culture of Nigeria had developed steel, or if African rice had been domesticated in Mali before 3000 BC? But while alternate history has been wonderful exercise for the imagination, have my half-million words of it helped to teach me the craft of writing? In some ways I’m not entirely sure. Bulletin-board alternate history is different from published alternate history, with intellectual rigor and historical plausibility prized above storytelling. There’s a reason why the scenarios explored on alternate-history forums are usually called “timelines” rather than stories or novels: their object is more to build a different world rather than to tell the stories of its people. World-building is of course part of all speculative fiction, but on alternate history forums, it becomes the whole. Timelines often use more of the tropes of academic writing and popular history books than those of fiction, and the interactive nature of Internet forums turns them into something like seminars. There isn’t really an equivalent in published literature: Robert Sobel came close with For Want of a Nail, but that was a one-time tour de force that has never been, and possibly never should be, duplicated. For that matter, Sobel was an economic historian rather than a novelist by training, and while his writing was interesting to those of a historical bent, it violated most of the rules of good storytelling. I’d go so far as to say that bulletin-board alternate history is a different genre from the works of authors such as Turtledove or Stirling, and as such, it isn’t necessarily good training for literary writing. On the other hand, it isn’t entirely bad training. World-building is important, and participation in an alternate history forum is a master class in how to do it right and (just as critically) how to do it wrong. Bad alternate history is wish-fulfillment fantasy, in which the author picks an event and then proceeds from unspoken premises to paint the map his or her favorite color. Good alternate history is all about discovering the premises: taking a pivotal event and applying principles of historical cause and effect both to posit how the event might turn out differently and project the long-term outcome. Good alternate history is more science fiction than fantasy, and requires the author to develop an understanding of the political, economic, social, intellectual and environmental factors that drive human development. The research that I’ve done for my bulletin-board scenarios has improved my general knowledge and sense of plausible world-building as well as my knowledge of the specific cultures and personalities that have found their way into my writing. And even in bulletin-board alternate history, there’s plenty of room for storytelling. As I became more confident in writing timelines, I shifted more and more from the macroscale to the microscale, and began focusing on one-shot vignettes and the story arcs of historical characters. Of the works linked above, the Haitian one consists entirely of short stories (after some preliminary discussion) and I’m quite proud of a couple of them. Most of the others also intersperse short fiction with the general historical discussion: Malê Rising even includes literary selections “written” by authors living in the alternate universe, and aside from being good exercise in writing from different voices, one of those selections led directly to my first professionally-published story. So, yes, playing with history is part of my million words – not to mention that it’s been a lot of fun, and fun, at least, is never wasted. Let me introduce myself: I’m Jonathan Edelstein, a long-time Internet friend of Aziz. I live in Queens, I’m married with no children but one cat, and I’m about halfway through my forties. I practice law, and hope someday to get it right. I’ve been writing recreationally since I was four years old – my “first novel,” complete with illustrations, was about a cat who drove a truck, and I still have it somewhere in the closet of my spare room. Last year, I broke into the pro scene with First Do No Harm, a short story published at Strange Horizons, and The Shark God’s Child and The Starsmith will appear soon in Beneath Ceaseless Skies and Escape Pod. 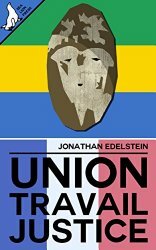 Through the good offices of Sealion Press, I’ve also published Union, Travail, Justice , an 8000-word alternate history story set in a Gabon that voted against independence in 1958; Luke didn’t care for it, but you might. First Do No Harm takes place 30,000 years from now in a society that is emerging from a dark age, and is about medical ethics and the conflict between scholastic and scientific approaches to knowledge. Various reviewers have characterized the story’s future as too much like the past and not enough like the past; I’ll leave it to you whether it’s too hot, too cold or, as other reviewers thought, just right. What I’d like to discuss instead is the cultural setting. Mutanda, the world of First Do No Harm (and the forthcoming Starsmith), has a language and society that are adapted from those of the Lamba ethnic group of the Zambian Copperbelt. The Lamba cosmology is, in some ways, made for science fiction, particularly in its concept of the awantu. The awantu maintain the sun, moon and stars – a cosmic working class, if you will – but the remarkable thing about them is that they’re people, with the “ntu” root that means “person” in almost all Bantu languages, and not gods or spirit creatures. They are people of another creation from humans, but they’re conceived as natural beings: in science fiction terms, as aliens. The awantu play only a background role in First Do No Harm, but many of the kinship customs, words and names shown in the story are also adapted from the Lamba. Of course, no culture is likely to remain pure over 30,000 years, so there are elements drawn from other places: the clan structure owes a great deal to Gabon, the religion to the Yoruba, the clothing to several parts of West Africa, and if you’ve been to Lagos, then Chambishi Port might be a bit familiar. When The Starsmith comes out, you’ll see some Mandé and Shona influence, and if I sell other stories in the same universe, there will be echoes of other places, as well as cultural traits that appear nowhere on earth. And The Shark God’s Child, a fantasy, is set in an Austronesian-based culture that combines elements of Melanesia, Micronesia, Borneo and Madagascar. Anyway, by now, you’ve probably figured out that I enjoy world-building and writing from the point of view of other cultures. I plead guilty as charged – Africa and the Pacific have been interests of mine for more than a quarter-century, I’ve published professionally on issues of Melanesian law, and I’ve been an honorary member of a Yoruba family for some years. I’m also a white Jewish guy from Queens, which means that when I discuss my stories, I sometimes end up in a conversation about cultural appropriation. I hate the term “cultural appropriation,” because it conceives of culture as property and also as something that has clear boundaries. In fact, cultures blend into each other, and they have begged, borrowed and stolen from each other for as long as humans have been recognizably human. People and nations have migrated, traded and fought since immemorial times, and as they’ve done so, they’ve adapted and repurposed others’ cultural artifacts. The story of Noah’s Ark came from Gilgamesh; Christmas is Saturnalia with the serial numbers filed off; the stories of Indra, Zeus and Thor are sometimes uncannily familiar. Appropriation and adaptation is how cultures are made. But however much I dislike the term, I recognize the thing. Culture may not be property but it is patrimony, and parts of it are sacred. Cultural artifacts aren’t meant to be superficial decorations, and they aren’t meant to be used offhandedly as window dressing or, worse, portrayed with a false claim of authenticity. The recent controversy about J.K. Rowling’s expansion of the Harry Potter universe, in which she placed the African magic academy Uagadou (a West African name used for the ancient Ghana empire and Burkina Faso’s capital city) in Uganda and decided that the skinwalkers of Navajo myth were in fact evil wizards, comes to mind, but there have been others. So, when I build my worlds, I realize I need to walk a fine line and to draw from others’ stories without claiming to tell those stories for them. My overriding concern is to treat my source material with respect: to research thoroughly, to consult with people from the source culture (and let them know what I’m doing) whenever possible, to listen if anyone from that culture has issues with my portrayal, and to treat cultures as something three-dimensional and integral parts of the story rather than decorations. I try to take lessons from those who have gone before me. Above all, I try to acknowledge that I’m a tourist in other cultures and that I have an obligation, as any tourist would, not to litter the place and write my name on the walls. Neil Gaiman famously said that anyone offended by the term “political correctness” should simply replace it with “treating other people with respect,” as in “Oh my god, that’s treating other people with respect gone mad!” Maybe the cultural appropriation debate might best be viewed the same way. If I can achieve “treating other people with respect gone mad,” then maybe I’m doing something right, and I’m always grateful for any help in getting there.